Comprehensive review of MyChelle Remarkable Retinal Serum. See how this retinol cream compares against other wrinkle creams! 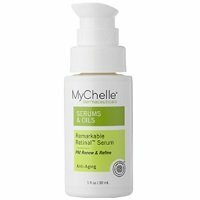 MyChelle Remarkable Retinal Serum is a pretty good retinol serum that works to help with anti-aging. The texture and feeling of this serum is thicker than a lot of other serums, and it feels very sticky on the skin. The serum comes in a bottle with a pump, but since it’s a thicker serum, you have to use about 2-3 pumps which is a bit more than I normally have to use with other serums. The smell of this product is not my favorite; it smells like citrus and green tea, and the scent is super strong and overpowering. After using this product for a short period of time, I really didn’t notice any difference to my skin or the fine lines and wrinkles on my face. After using this retinol serum for a longer period of time, I started to see a nice difference in the fine lines on my face. I also saw improvement on the texture and hyperpigmentation on my skin which I really liked. Although it helped with fine lines, I didn’t see a huge difference on the deeper wrinkles on my face and neck. Overall, MyChelle Remarkable Retinal Serum is a good serum that helps with anti-aging and plumping up the fine lines of the face. The texture of MyChelle Remarkable Retinal Serum is more like a lotion than a serum. When you first pump out the product, it has a neon yellow color and it feels very sticky. As you apply it onto your skin, it continues to feel sticky and kind of thick. MyChelle Remarkable Retinal Serum is pretty easy to apply with a pump applicator. Since it’s thicker than a typical serum, it takes more product to cover the face. Something a bit annoying about this product though is that you have to wait 30 minutes to apply other products to your face for best results. I find that pretty inconvenient. It took me about 2 pumps to cover the entire face and you’ll need a few more pumps if you want to apply it to the neck and chest. MyChelle Remarkable Retinal Serum takes about 20-30 seconds to dry, but even after it’s dry, it feels a bit sticky. The smell of MyChelle Remarkable Retinal Serum is a bit odd; it’s very strong and smells like citrus and a bit like green tea. After using MyChelle Remarkable Retinal Serum, I didn’t notice any difference at all to my fine lines and wrinkles, or to my skin in general at all. Over a longer period of time using MyChelle Remarkable Retinal Serum, I started to notice that it was helping my fine lines as well as helping with skin texture and hyperpigmentation. I noticed it was especially helping the fine lines around my eyes but it wasn’t doing as much for the deeper wrinkles around my mouth or on my neck. MyChelle Remarkable Retinal Serum is full of a lot of interesting ingredients, especially a lot of oils and extracts, including lavender oil, lemongrass oil, and aloe vera. Lavender oil is great for helping with fine lines and wrinkles by healing the skin and restoring elasticity. Next, lemongrass oil can help with anti-aging with its astringent properties that helps minimize pores, tightens the skin, and reduces the appearance of fine lines and wrinkles. Lastly, aloe vera is a very healing ingredient which can help plump fine lines and wrinkles and help nourish the skin. These three ingredients are very interesting and could help the skin with anti-aging and plumping fine lines and wrinkles when combined. The cost of MyChelle Remarkable Retinal Serum is $47.50 for 1 oz of product. This is definitely a more expensive price for a retinol serum. Thankfully, there is a 100% money back guarantee for MyChelle Remarkable Retinal Serum. To buy MyChelle Remarkable Retinal Serum, click here. Ingredients Lavender oil is great for helping with anti-aging.